They are on the ocean surface and in the abyss, in soil and plants, not to mention the intestines of insects and large mammals, including humans. They are bacteria, and they are present in ever corner of our planet. 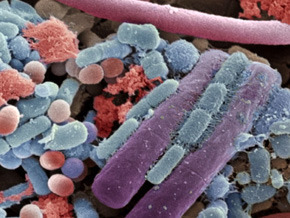 Are we aware that among the billions of bacteria that exist on earth, less than 1% of them are pathogenic? Recent discoveries reveal that bacteria are not only linked to the very origins of life on earth, but that they have become indispensible to the continuation of life. Researchers today say that bacteria are partly responsible for the process of evolution, a point of view that encourages us to take a closer look at Darwin’s theory. Breathing, eating, digesting, growing, protecting and reproducing - in all of these essential functions, humans and earth’s other organisms live in close symbiosis with bacteria. A Bacterial World will delve into this vast subject and explore a new vision of interdependence with bacteria.